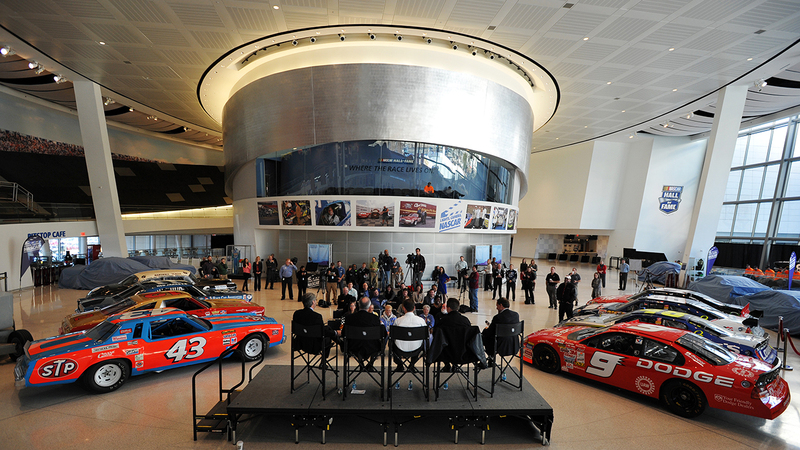 The extreme makeover of the NASCAR Hall of Fame’s "Glory Road" is nearly complete, with the Hall scheduled to re-open Jan. 11. All 18 Glory Road cars are new, the first wholesale changeover since the Hall opened in 2010. Marshall Teague’s 1952 Hudson Hornet – The early days of NASCAR were dominated by the now-defunct Hudson brand, the first manufacturer to actively support stock-car racing. Teague and his Hudsons won consecutive races on the old Daytona Beach & Road Course in 1951-2. 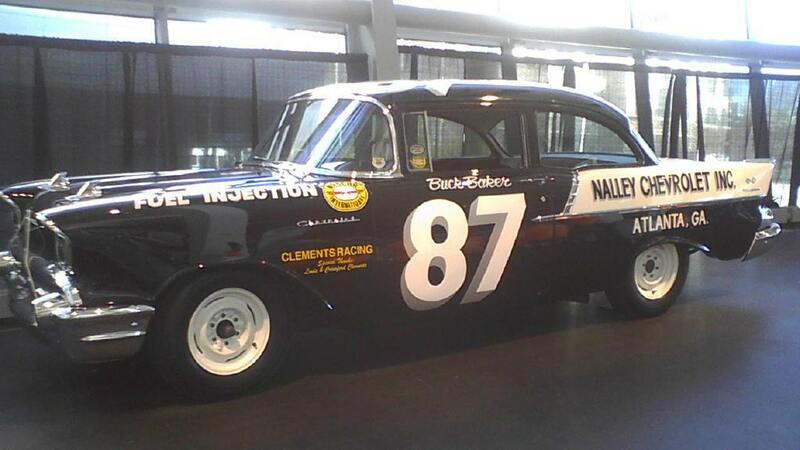 Buck Baker’s 1957 Chevrolet "Black Widow" – During the 1957 season, Baker led all drivers with 10 victories and six poles, becoming the first driver to win back-to-back NASCAR Grand National (now Sprint Cup) championships. Wood Brothers Racing 1961 Ford Skyliner – Both Curtis Turner and 2012 NASCAR Hall of Fame inductee Glen Wood spent time behind the wheel of this sleek 1961 Ford Skyliner, entering a total of 15 races between them. Fred Lorenzen’s 1966 Ford Galaxie "Banana Car" – One of the most controversial NASCAR race cars of all time was this utterly tricked-up Ford Galaxie owned by Junior Johnson. Chopped, channeled and heavily modified, it only raced once. The next season, NASCAR introduced body templates. Ned Jarrett’s 1966 Ford Fairlane – The 1966 season would prove to be the final one for two-time NASCAR champion Ned Jarrett, one of the sport’s true ambassadors and a tremendous talent on the race track and later in the broadcast booth. 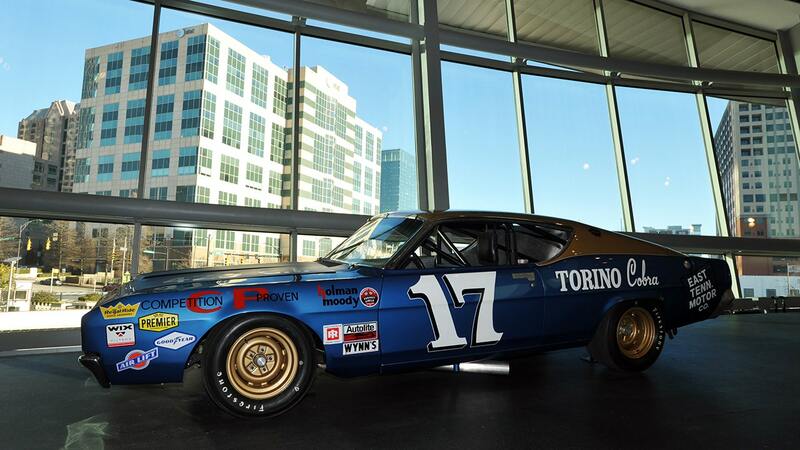 David Pearson’s 1969 Ford Torino Cobra Talladega – "The Silver Fox" earned his third NASCAR championship behind the wheel of this wind-cheating Ford, a limited-edition, aerodynamically improved version of the boxy Torino. Bobby Allison’s 1973 Chevrolet Chevelle – One of the toughest and most determined racers of all time, Allison drove to two victories in 1973 as an owner/driver, with brother Eddie Allison serving as his crew chief on this Chevrolet Chevelle. Cale Yarborough’s 1976 Chevrolet Laguna S-3 – One of the toughest drivers of all-time, the South Carolina native piloted this Junior Johnson-owned Chevrolet to his first of three consecutive Sprint Cup championships, a record unmatched until Jimmie Johnson won five in a row. Richard Petty’s 1979 Chevrolet Monte Carlo – The man known simply as "The King" took his seventh and final Sprint Cup championship in ’79, splitting time with Chevrolets at short and intermediate tracks and Oldsmobiles at superspeedways. 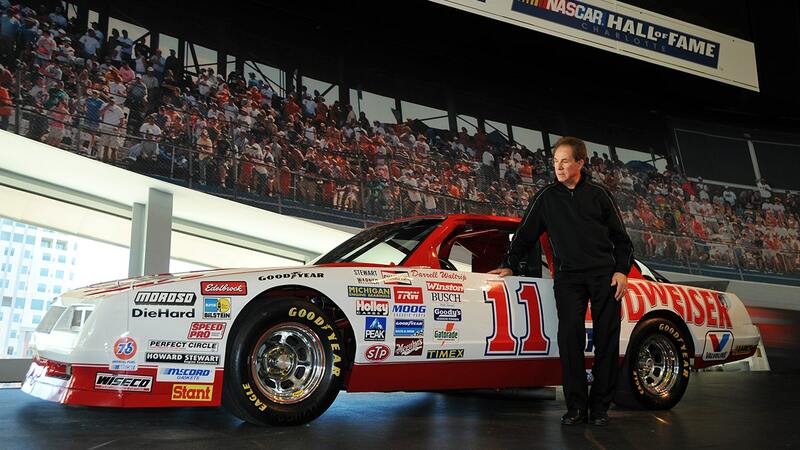 Darrell Waltrip’s 1986 Chevrolet Monte Carlo Aerocoupe – Driving for Junior Johnson, Waltrip took his second consecutive title and third overall in this limited-edition Chevrolet, with a special rear window to help it at fast tracks. Dale Earnhardt’s 1990 Chevrolet Lumina – Face it, how could it be the NASCAR Hall of Fame without a black No. 3? Answer: It couldn’t. 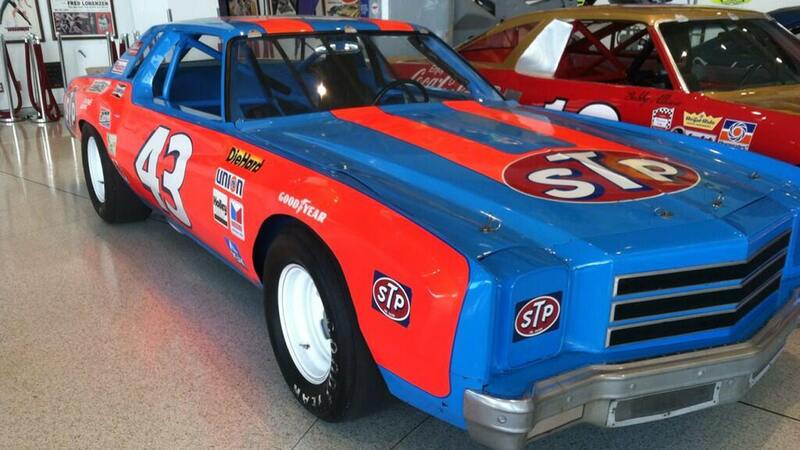 This was Earnhardt’s car for his fourth championship overall and third with car owner Richard Childress. Jeff Gordon’s 1994 Chevrolet Lumina – At the age of 22, Gordon drove this Hendrick Motorsports Chevy to his first NASCAR Sprint Cup race victory in the Coca-Cola 600. He would go on to win three series championships in the next four years. Rusty Wallace’s 2000 Ford Taurus – A short-track specialist, Wallace won his 50th career NASCAR Sprint Cup race at Bristol Motor Speedway, one of his favorite tracks. This is the Penske Racing Ford that he scored his milestone victory with. 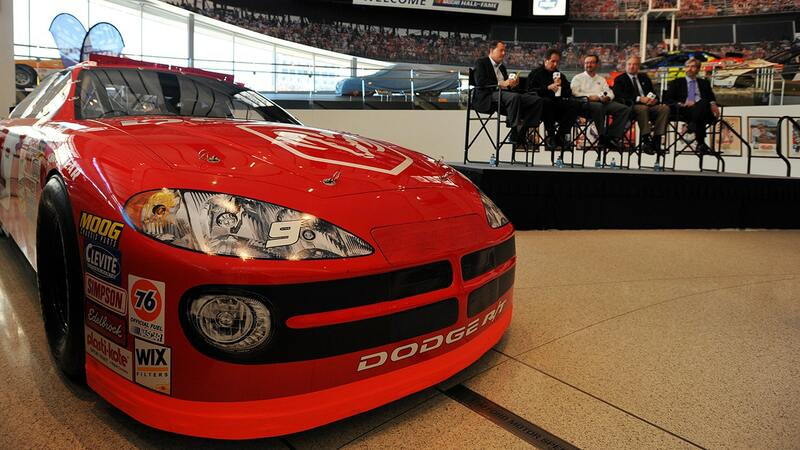 Bill Elliott’s 2001 Dodge Intrepid – Crew chief turned team owner Ray Evernham brought Dodge back into NASCAR in 2001 and 1988 Sprint Cup champ Elliott put this car on the pole in its first points race, the 2001 Daytona 500. Jimmie Johnson’s 2006 Chevrolet Monte Carlo SS – Now a six-time Sprint Cup champion, this is the car that Johnson won his first championship in. He clinched his title at Homestead-Miami Speedway, where he finished ninth in this No. 48 Hendrick Chevy. Dale Earnhardt Jr.’s 2008 Chevrolet Impala SS – In 2008, NASCAR’s perennially most popular driver moved from Dale Earnhardt Inc., the team started by his late father, to Hendrick Motorsports, where he won the Sprint Unlimited and his Budweiser Duel Daytona 500 qualifying race, his first two starts with the team. Tony Stewart’s 2011 Chevrolet Impala – In an improbable championship run in 2011, Stewart won an amazing five of 10 races in the Chase for the Sprint Cup to take his third series title. This is the car he drove to victory in the season finale at Homestead. Matt Kenseth’s 2013 Toyota Camry – In his first season with Joe Gibbs Racing, Kenseth was simply sensational, winning seven races and finishing a close second to Jimmie Johnson in the championship race.